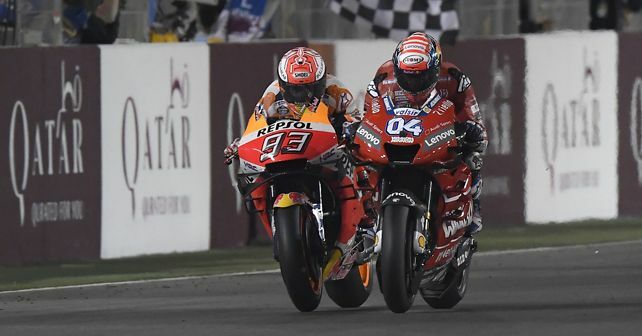 This year’s Qatar race was almost a carbon copy of what happened last year, with Dovizioso and Marquez tangling with each other for another photo finish. So, has nothing changed at all? Technically, yes. Despite all the changes and shuffling of riders and teams, the finish of the first race of the season was like watching the finish of the first race of the last season – Andrea Dovizioso (Ducati) and Marc Marquez (Honda) ran a repeat show as they tangled with each other in a nail-biting last lap, last corner thriller, yet again. And just like in 2018, Dovizioso got the better of Marquez and pipped him – and this time the gap was even slimmer, 0.023s at the finish line! Having said that, Honda has definitely improved their package over Ducati, especially in terms of top-speed – Marquez clocked 352km/h during the race as compared to Dovizioso’s top speed of 346km/h. However, it was quite apparent that Ducati still has more mechanical grip while exiting corners and, consequently, better acceleration. Taking the third spot on the podium was LCR Honda’s Cal Crutchlow. And what a performance it was! This was Crutchlow’s first race after his ghastly crash in Philip Island in 2018, where he suffered multiple fractures in his right ankle. It was really a remarkable performance from him, considering what he’s been through in the last few months. Another impressive performance in Qatar GP came from Suzuki. In the initial part of the race, both their riders, Alex Rins and rookie Joan Mir, hounded Ducatis and Hondas with their superb mid-corner speed. In fact, they just missed the podium as Rins finished only 0.137s behind Crutchlow to take fourth. 2018 was Yamaha's worst season in a very long while, mainly because their bike suffered from acceleration and grip issues, which prevented their riders from winning races. As expected, Yamaha worked hard to address these issues over the winter, and with Vinales taking the pole position for the race in Qatar, everyone thought that Yamaha's bad times were indeed over. But, unfortunately, that doesn't seem to be the case now, as Yamaha once again seemed to be at sea during the race. Despite starting from pole, Vinales had no answer to the pace of Ducati, Honda or even Suzuki, as he finished 7th. His teammate, Rossi, however, again showed why he's the 'Sunday' man as he ran an impressive race and finished fifth from 14th on the grid! Regardless of his spectacular performance, Rossi wasn't too optimistic and pointed out that their performance is more or less the same as it was in 2018. If that's actually the case, then Yamaha needs to get their act together soon, otherwise, this year too they’ll have a very long and painful season. The thrill and excitement of the first race were marred – or accentuated? – by a bit of a controversy that followed, as four teams, namely Honda, KTM, Suzuki and Aprilia, lodged a complaint against Ducati for using an illegal aero part in three of their bikes, including Dovizioso’s race-winning machine. The part in question was a winglet attached to the swingarm. Now, Ducati says that this was installed for cooling the rear tyre, while the complainants claim that it produces a significant amount of downforce – something that’s illegal as per the technical guidelines. While the complaint was initially rejected by the Stewards, the decision now lies with FIM MotoGP Court of Appeal. If proven guilty, it may result in Dovizioso and Ducati being stripped off their Qatar win!